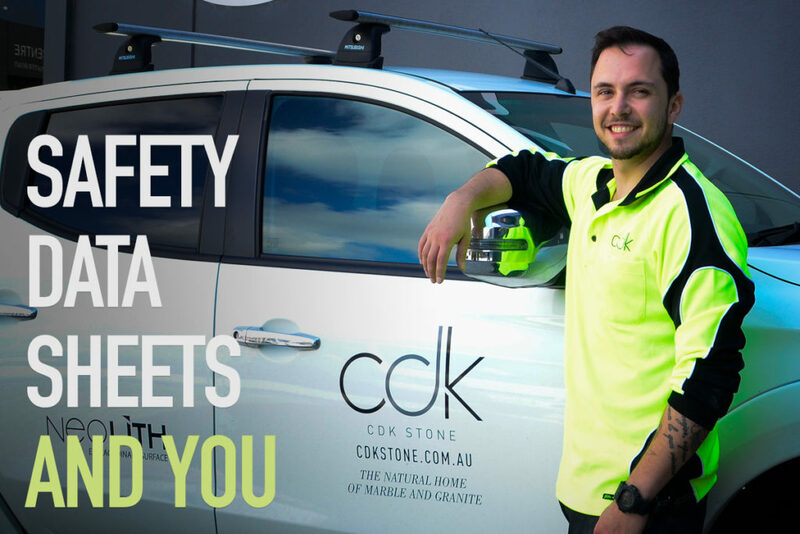 CDK Stone are committed to ensuring our industry stays safe. 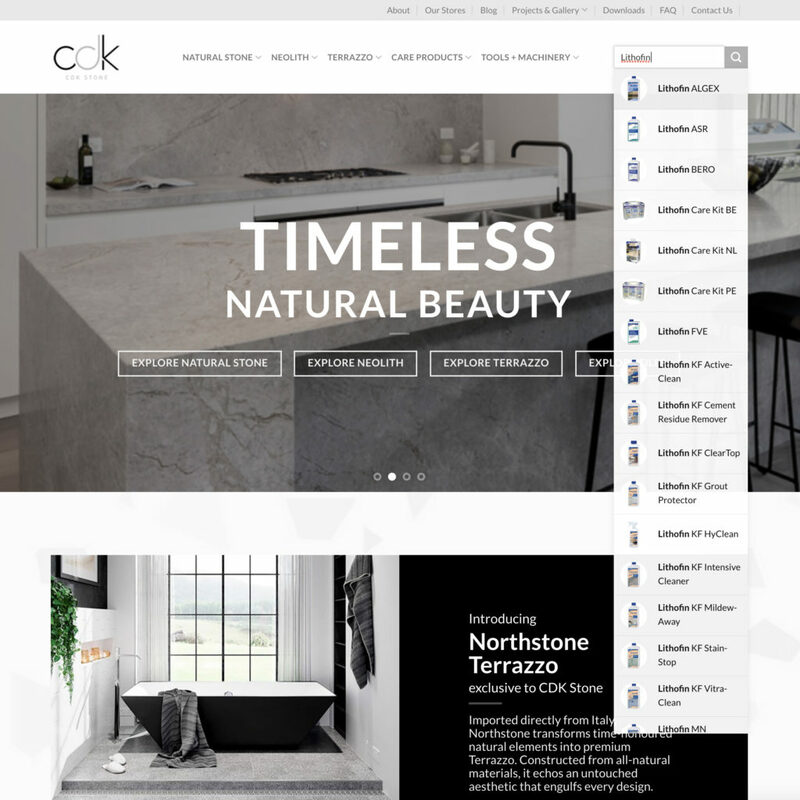 As part of our ongoing efforts to educate and inform the industry, CDK Stone are encouraging our customers to stay up to date with the latest SDS for each product they use. WHY SHOULD I READ THE SDS? 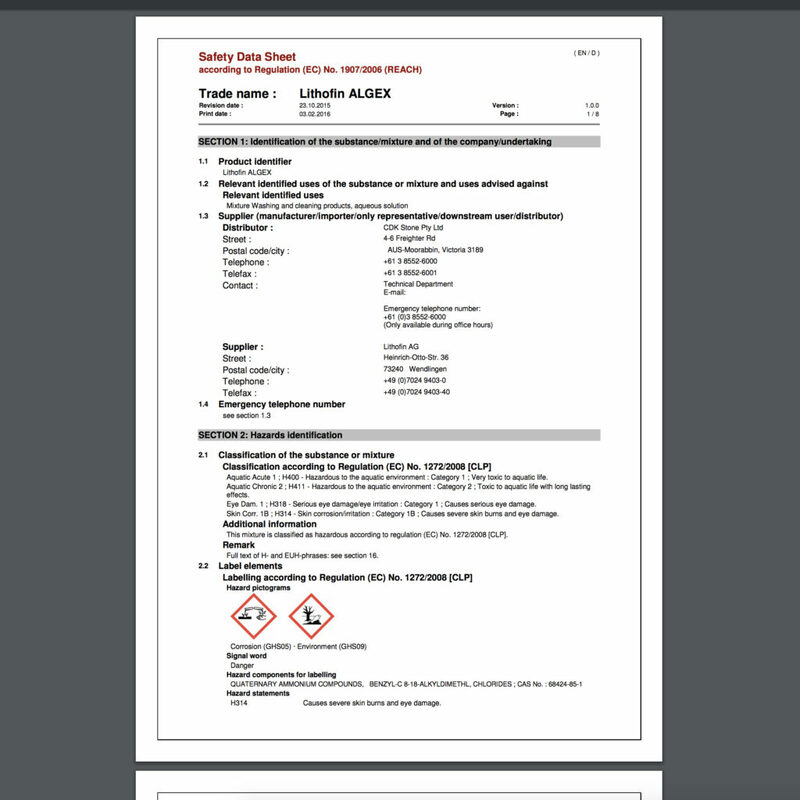 The SDS is a key information resource for workers and persons conducting a business or undertaking in managing the risks of a hazardous chemical in a workplace. It is important that workers read the SDS carefully and understand its contents before working with a hazardous chemical so that it can be safely stored, handled or used in the workplace. Not all information about the hazards of a chemical or instructions for safe storage, handling and use may be provided on labels. In most cases, the SDS will contain much more information about a hazardous chemical than appears on the label. 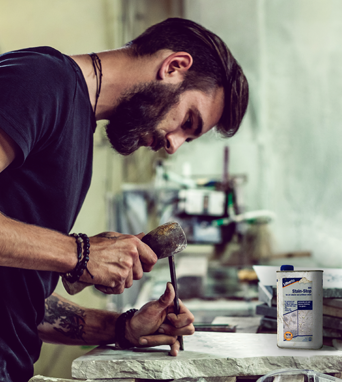 To assist you with complying with Australian Work Health and Safety laws, we encourage our customers to read through the SDS’s for the products you use and take the necessary precautions. HOW DO I GET THE SDS? 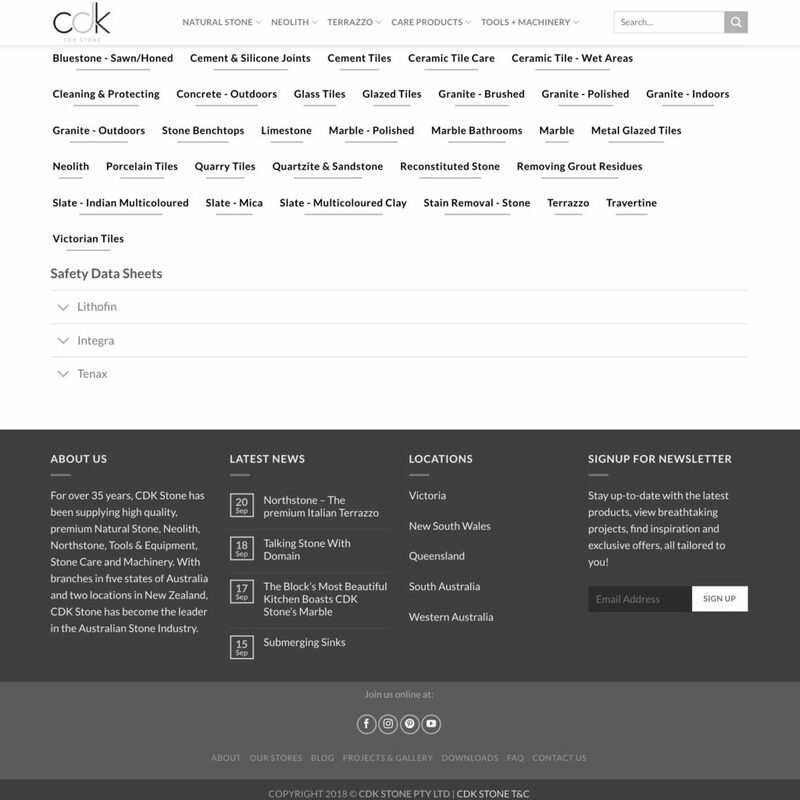 On the CDK Stone Homepage, click the ‘Downloads‘ link at the top right menu. 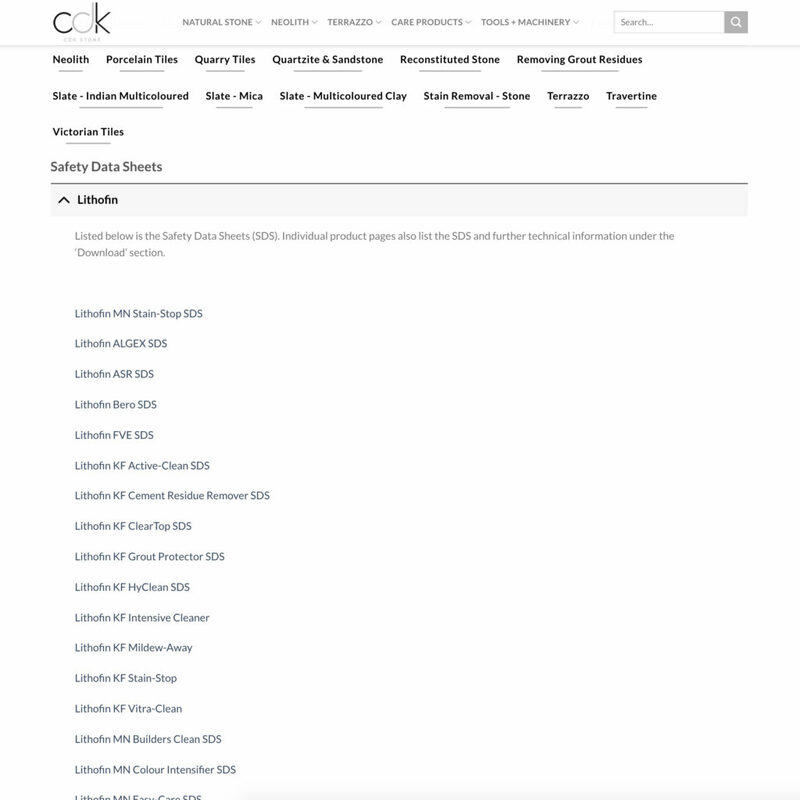 Scroll down to the ‘Safety Data Sheets‘. Click on the relevant brand. The SDS’s for all the brand’s products are available here, click on the relevant product. 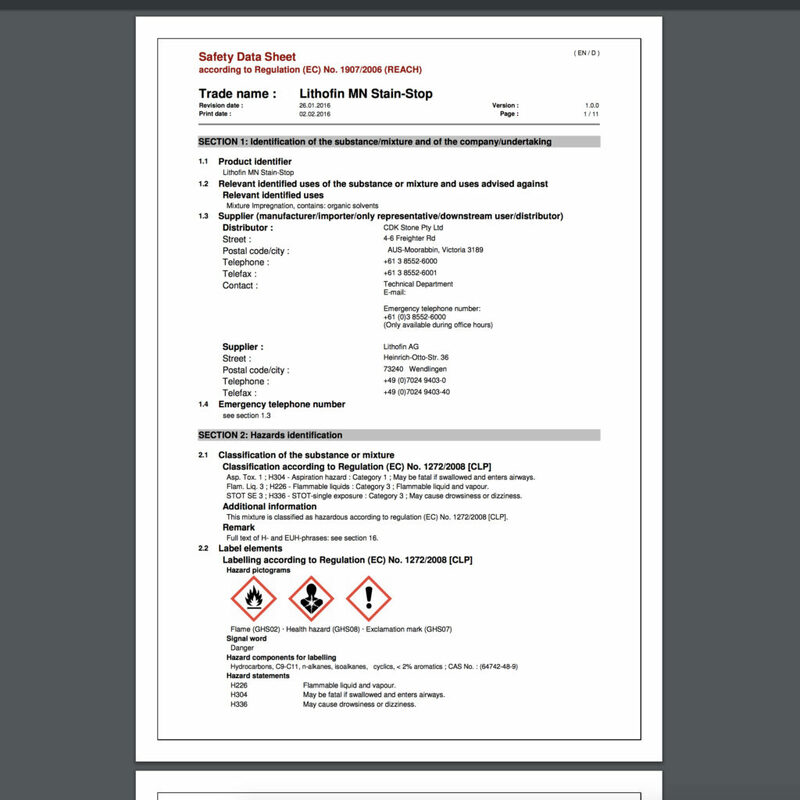 Read through the product’s Safety Data Sheet. 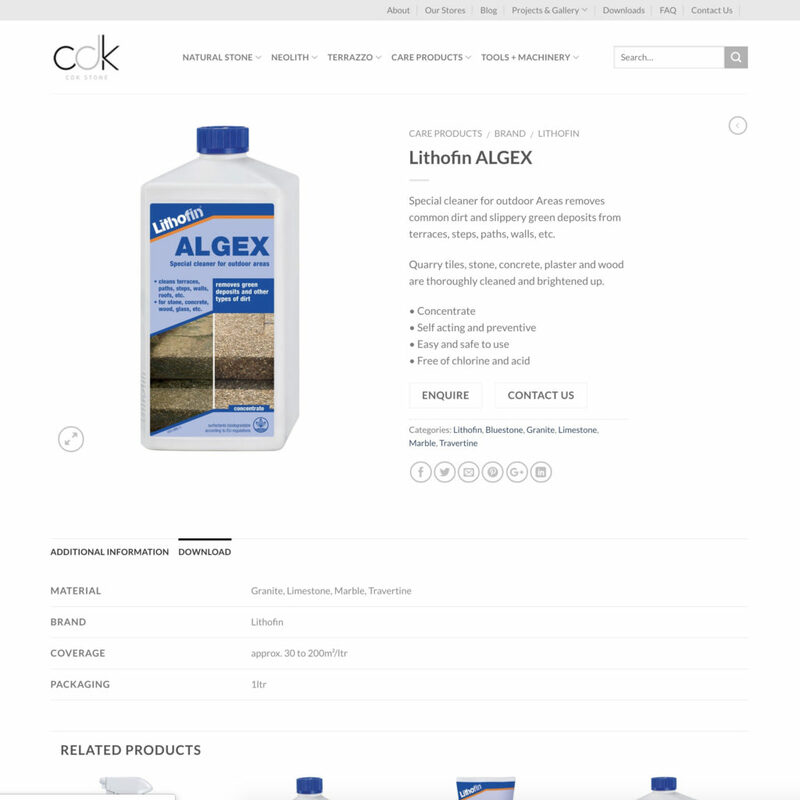 The Safety Data Sheets can also be accessed through the product pages on the CDK Stone website. 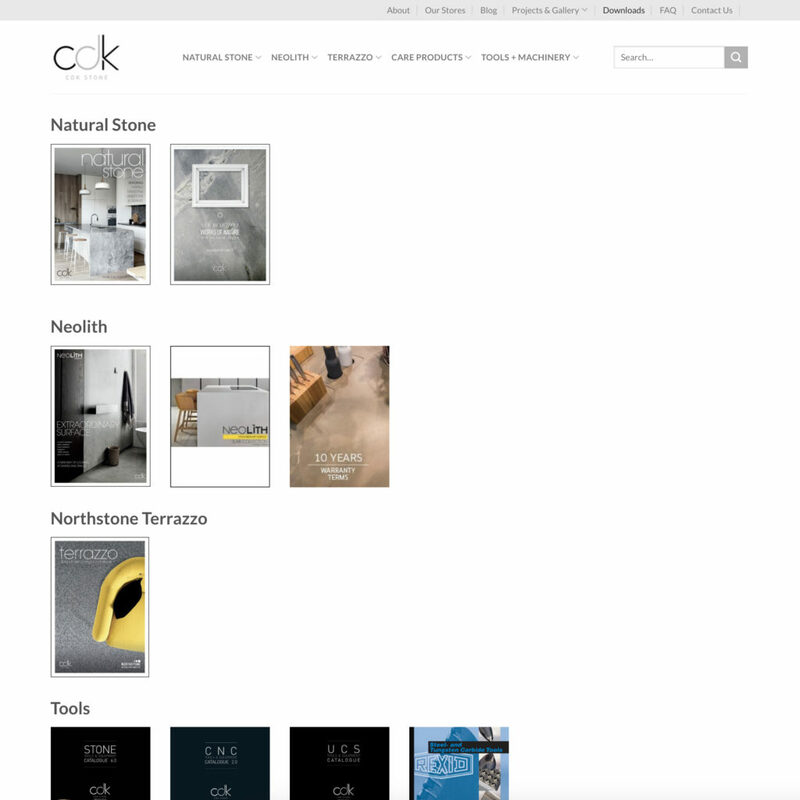 Click on the ‘Search Box’ at the top right of the CDK Stone Homepage. 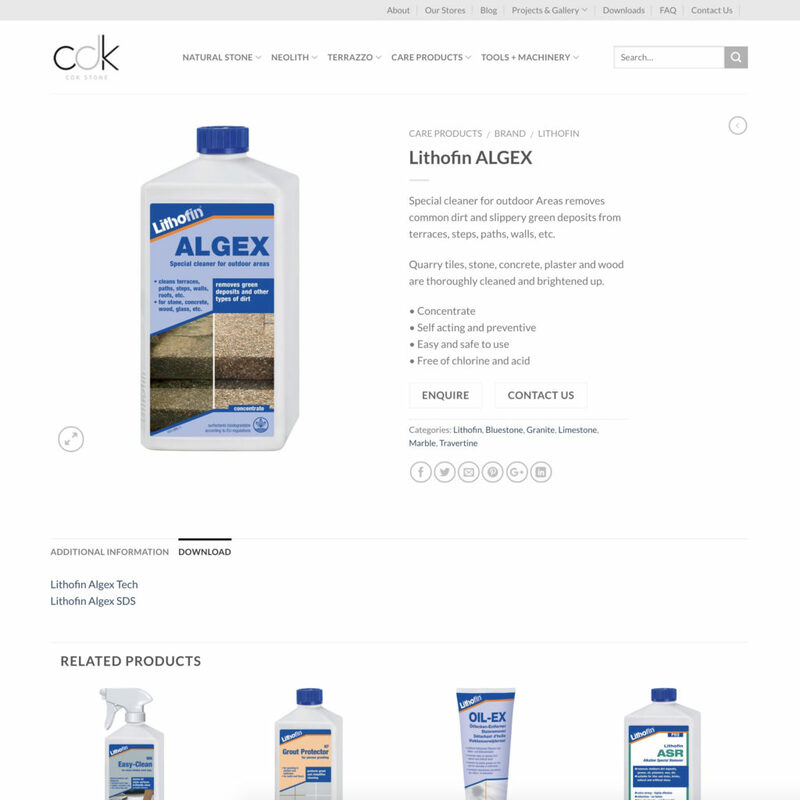 Search for the product you’d like the SDS for and click on the relevant product’s product page. Click on the ‘Downloads’ tab underneath the product image. Under the product image will be the SDS’s for that particular productt. 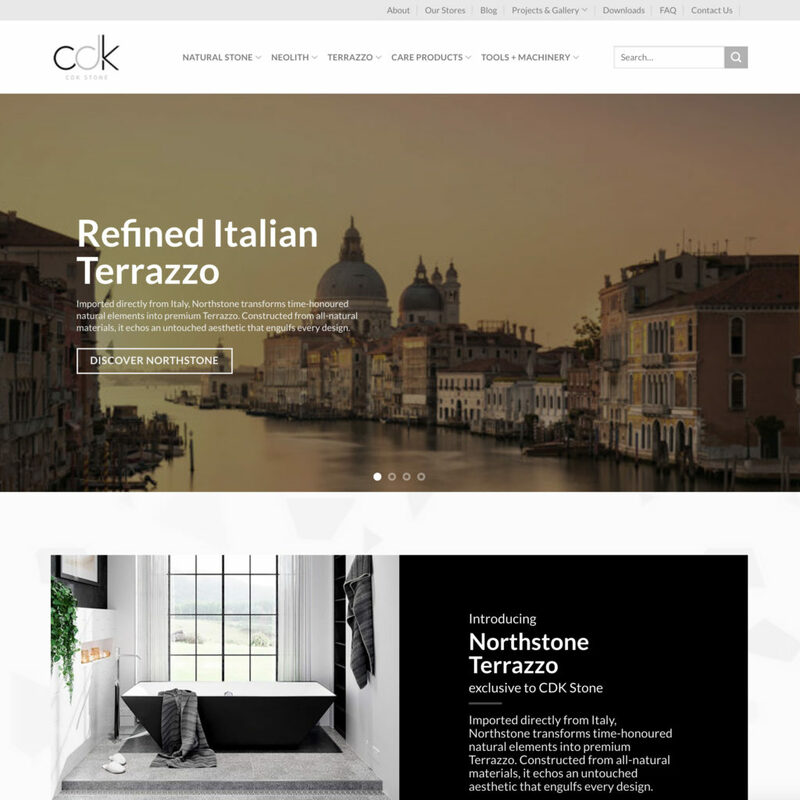 This entry was posted in CDK Stone, Tools & Equipment. Bookmark the permalink.